In the CV tracks when I use midi recording i hear the notes as i play, but in the new midi track i can record but i'm not hearing what im playing. only after it loops back around I can hear what i played. this makes it very hard to record a sequence and i don't think this behaviour is meant this way? Then I use the midi sequencer in Octatrack to route midi back to the deepmind or through to the nerdseq to the digitone. Something I noticed when testing out the automator today; the playback indicator ( [ ] and > symbols) does not update during playback unless you "refresh" the screen by pressing one of the cursor buttons. I included a simple NRD file so you can see for yourself. Not really anything huge but I was freaking out thinking I didn't understand how to trigger automations properly. Hi! A bug so minor that i doubted if I should report it at all: in sequencer screen when you copy sequences (e.g. to make another "island") their color is not copied. Or maybe it's not a bug but how it's intended to be? What is this mystery expander? Just saw this when looking at the trigger expander video. What do we have here? Just realized it might not be an expander at all and could be a standalone module too! Doesn't change my curiosity though. Not sure if it's already possible but looking into the manual I don't see how. easy what do you guys think? that would be unreal to have that. I just uploaded the new FW and I just saw that as soon as you are into the NERD menu of track the timing above the screen stop moving. I would love to see it running so I'll be able to manage the clock division in a better way. Thank you so much for all the update, love the Nerdseq more and more ! The 'More Triggers 16' Expander is finally available which adds 16 more Trigger/Gate outputs to the NerdSEQ. It took a while and many availability questions, but they here now. Next to the multiple outputs they are new screens added to the NerdSEQ which allow comfortable and flexible usage of the expander! It's available now in the XOR Webshop in Grey and in Black. A massive update just arrived. Adding some long awaited features, some unexpected stuff and fixes. Also there is support for expanders included and the 'More Triggers 16' expander is available now, too. Check another thread here for that one. - Old Projects from V1.18C and older can simply be loaded with the new version. Projects are not full downward compatible. So they might be some oddities if for expample saved with V1.19 and loading it with an older version V1.18 or earlier. - new pattern screen for 4 note polyphonic (+ Velocity) sequencing per track. - Midi notes can be played (cloned) on the local modular tracks (CV & Gate) if wanted. - Added: NSA (Nerd Sound Adapter) Expander support. Beside the Midi expander 4 additional expanders can be connected which are then integrated in the sequencer. - Expanders can be assigned to one or multiple tracks. 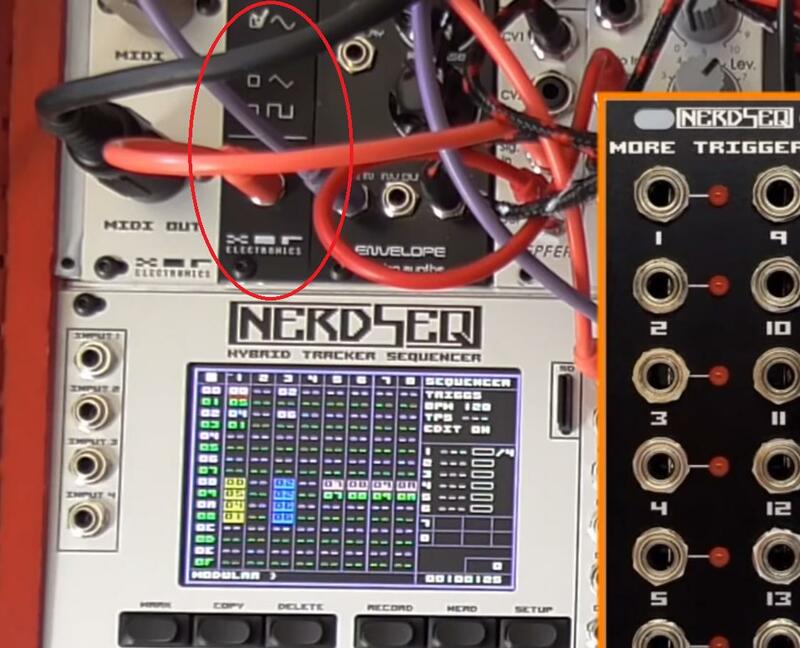 - Firmware updates of the expanders simply possible via the NerdSEQ. So new features are also possible for the expanders. As reliable as NerdSEQ firmware updating. - Added Trigger 16 screens and sequencing + integration with all FX and Automators. - Added Track Setup screen for all track types where Track specific settings can be done. - Added: General Track Assign screen where tracks can be assigned to either Internal CV/Gate, Midi or to the available expanders. - Added: SHIFT+DELETE on a Note column acts now as either 'Delete Note' or as 'Insert Note Off', no browsing down to lowest note needed anymore. - Added: Copy paste between compatible pattern columns. Copy and paste can be from all notes to all notes, triggers to triggers, grooves to grooves from different pattern types. Content can now also be copied between the 2 sample parts. - Added: Per track multiplier / divider. Dividers and Multipliers can be either live assigned to a track or via FX command. The new firmware is attached here. This time also as .zip, so you need to unpack it into the firmware folder te be able to use it. Please check the firmware update thread as well and read in the manual in case of any update issues. I uploaded a new manual V1.0.6 which includes all information about the firmware version V1.19. Is this deliberate? A bug? It seems quite strange.